Nothing says summertime like a hamburger fresh off the grill. The tasty grill marks and the smoky good flavor on a fresh bun with lettuce and tomato and all the fixin’s… mmm mmm good! 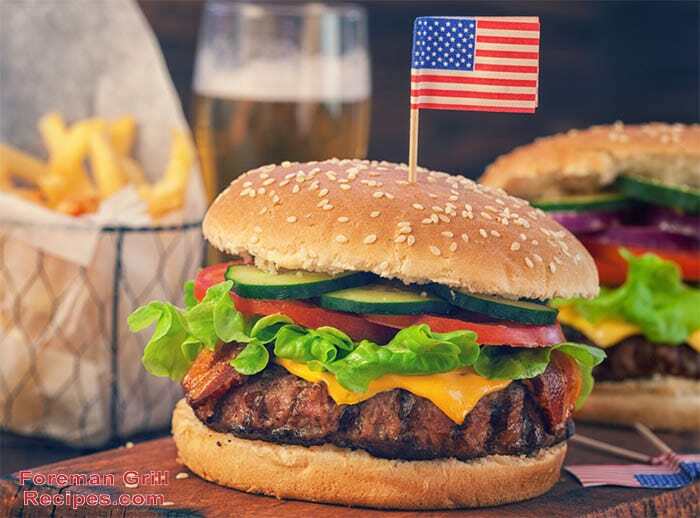 But for those instances where you don’t have access to an outdoor grill, you can make a wonderful and delicious grilled burger right in the convenience of your own kitchen with a Foreman Grill. In fact, depending on the size of the Foreman Grill you have, you can probably make enough for the whole family! Follow this recipe and these few easy steps and you may never venture outdoors to mess around with the charcoal grill again. Your Foreman Grill is the perfect companion to making some of the best burgers you’ve ever tasted. Preheat your George Foreman Grill for at least 5 minutes with the lid closed. This is important as to get the grill plates nice and hot and to sear in the flavor of the burgers. Mix all ingredients well in a bowl using your hands. Shape into 4 1/4lb patties and place on grill. Close lid. Burgers will cook pretty quick. It’s a good idea to check on them after about 3 minutes. When yuo can see they’re completely cooked on the outside, you’re real close to having medium-doneness burgers. You can also rotate the patties a 1/4 turn to get cross grill marks. The liquid smoke and the Worcestershire sauce will really give the burgers that outdoorsy/smoky flavor. Feel free to experiment with the amounts you add to your own taste preferences. The 1 tablespoon of Worcestershire sauce and 1 teaspoon of liquid smoke per pound ratio works well and is a good basis to work around. Be sure to serve burgers on a fresh bun. Add you favorite toppings and condiments! This recipe works great indoor or out !